The Chaco Owl is a medium-sized owl with a rounded head and no ear-tufts. Distribution: From southern Bolivia south to the Argentine provinces of Córdoba and Buenos Aires. Original Description: Cherrie, George Kruck, & Reichenberger, Elsie M.B. (Mrs.). 1921. American Museum Novitates (Am. Mus. Novit. ), no. 27: p. 1. 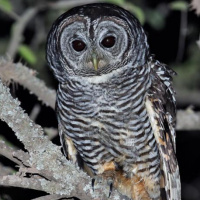 See also: Other owls from South America, Genus: Strix. Page by Deane Lewis. Last updated 2015-11-02.